NK cells constitute the first line of defense against pathogens and transformed cells. They mature in secondary lymphoid organs, including tonsils, where common pathogens, such as EBV, enter the host and potentially imprint differentiating cells, which then patrol the body via the blood stream. Therefore, we set out to characterize a distinct human NK cell population in tonsils that produces high amounts of the immunomodulatory and antiviral cytokine IFN-γ. We found that the tonsilar IFN-γhigh NK cell subset is CD56brightNKG2A+CD94+CD54+CD62L−, is present in tonsils ex vivo and is more mature than other CD56bright NK cells in tonsils and less mature than other NK cells in blood, shows very low plasticity even after prolonged cytokine stimulation, accumulates in tonsils of EBV carriers, and is able to potently restrict EBV-induced transformation of B cells. Thus, we characterized a distinct and stable IFN-γhigh NK cell subpopulation that can specifically restrict malignant transformation of EBV-infected B cells. This subset should be exploited for future development of cell-based therapeutic approaches in EBV-associated malignancies. Natural killer cells are innate lymphocytes that were originally described for their ability to target virus-infected and transformed cells without preactivation (1, 2). Although they originally were thought to leave the bone marrow as fully developed effector cells and to reside primarily in the blood stream, reservoirs of NK cells were discovered more recently in other tissues, including secondary lymphoid organs (SLOs) (3, 4). These NK cells in lymph nodes and tonsils (SLOs) require activation by primarily dendritic cells to achieve full functional competence and mediate protection against pathogens (4–6). In tonsils, in contrast to peripheral blood, the most mature NK cells are CD56bright, whereas earlier differentiation stages are CD56dim (7). CD56+ cells in human tonsils also contain RORγt+ ILC3 cells (8, 9); for a more detailed characterization of CD56dim tonsilar cells, these cells would need to be taken into account. In humans, the NK cell reservoir in SLOs consists mainly of CD56brightCD16− NK cells. In peripheral blood, NK cells of this subset carry homing markers to SLOs and constitute only about one tenth of the circulating NK cells (4, 10). These blood CD56bright NK cells have longer telomeres and can develop into functional CD56dimCD16+ NK cells (4, 11, 12). Subsequently, they seem to acquire more and more inhibitory receptors, including killer Ig–like receptors (KIRs), during further differentiation (13). However, in contrast to mouse NK cells, which excel in their main effector functions (i.e., cytokine production and cytotoxicity) only after terminal differentiation (14), human NK cells acquire already potent cytokine production at the CD56brightCD16− differentiation stage (10). Intriguingly, NK cells in SLOs produce much more IFN-γ in response to IL-12 than do peripheral blood NK cells, and this reactivity resides nearly exclusively in the CD56brightCD16− NK cells of these organs (15). This effector function of NK cells can be especially useful in secondary lymphoid tissues at mucosal surfaces (e.g., tonsils) for restricting infections, because these are the sites where pathogens are first encountered as a natural entrance point. One such pathogen, which could be targeted by NK cell responses in tonsils, is EBV. EBV is a common γ-herpesvirus that infects >90% of the human adult population and enters the human body via tonsils after transmission in saliva (16). In the vast majority of infected individuals, EBV persists without symptoms under tight immune control by primarily T cells (17). However, in a subset of EBV carriers, the B and epithelial cell–transforming capacity of the virus causes detrimental EBV-associated malignancies (18). In this respect, the initial immune response to infection seems to be quite decisive, because symptomatic primary EBV infection (infectious mononucleosis) can predispose for EBV-associated malignancies (19, 20) and even autoimmune diseases (21). NK cells are part of this innate immune response to EBV and have been reported, somewhat controversially, to correlate either inversely or directly with viral titers during primary infection (22, 23). A protective function of these NK cell responses during primary infection is indicated by primary immunodeficiencies that affect NK cells and were suggested to predispose for EBV-associated malignancies (24, 25). Furthermore, X-linked lymphoproliferative disease–associated mutations, which predispose affected males to fatal lymphoproliferative disease upon primary EBV infection, compromise NK cell recognition of EBV-transformed cell lines (26). These mutations also affect other components of cell-mediated immunity, such as T cells. Nevertheless, NK cells clearly contribute to early restriction of EBV infection and lower the risk for EBV-associated diseases. Palatine tonsilar NK cells, which are located at the site of EBV entry, are ideally suited to mediate this early restriction, and we demonstrated previously that NK cells of these SLOs can limit B cell transformation by EBV with their superior ability to produce IFN-γ (15). In the same study, we also noted that only a subset of tonsilar NK cells produced these high levels of IFN-γ. Therefore, in this study we set out to characterize this IFN-γhigh NK cell subset. In this article, we report that cells from this IFN-γhigh NK cell subset are CD56brightNKG2A+CD94+CD54+CD62L−, are enriched in tonsils of EBV carriers, and specifically restrict EBV transformation of B cells. Moreover, this subpopulation lacks homing markers to SLOs and seems to be primed to transition into the periphery to carry out innate immune control of EBV infection. Studies on human samples for the immune control of human γ-herpesvirus infections were reviewed and approved by the cantonal ethical committee of Zürich, Switzerland (KEK-StV-Nr. 19/08). Tonsils and blood samples of children were collected after informed consent of the legal guardians. Lymphocyte concentrates from adult donors were obtained from the Swiss Red Cross Blutspendedienst Zürich (Zürich, Switzerland) after informed consent of the donors. The following anti-human mAbs were used in this study: CD3 Pacific Blue (Invitrogen); CD3 allophycocyanin Cy7, CD56 PE Cy7, IFN-γ allophycocyanin, CD19 PE, CD19 allophycocyanin Cy7, CD94 PE, CD62L allophycocyanin, CD62L PE, CD21 allophycocyanin, CD23 FITC, CD336 PE, CD103 FITC, and isotypes (BD Biosciences); CD117 PE (Miltenyi Biotec); NKG2C allophycocyanin (R&D Systems); CD45RA FITC and CCR7 PE, CD57 FITC, CXCR3 allophycocyanin, perforin FITC, CD54 Pacific Blue, and CD16 allophycocyanin Cy7 (BioLegend); NKG2A PE, NKG2A allophycocyanin, and KIRs—CD158a,h PE, CD158b1,b2,j PE, CD158a,h allophycocyanin, and CD158b1,b2,j allophycocyanin—(Beckman Coulter). Live cells were routinely distinguished using the LIVE/DEAD Fixable Aqua Dead Cell Stain Kit (Invitrogen). The following endotoxin-free recombinant human (rh) cytokines were used: rhIL-12 (R&D Systems), rhIL-2 (PeproTech), and rhIL-15 (Sigma). Tonsilar cell single-cell suspensions were obtained by mechanical dissociation of the tissue and mechanical filtration through a 75-μm nylon cell strainer. After Ficoll-Paque Premium gradient centrifugation (GE Healthcare) to remove dead cells and debris, cells were washed extensively and partly cryopreserved or used directly. Leukocytes of blood samples and leukocyte concentrates were purified by Ficoll Paque Premium gradient centrifugation and washed several times. B cells were isolated through magnetic bead cell separation (MACS; Miltenyi Biotec) by CD19+ selection. NK cells were isolated through negative MACS selection using the NK cell isolation kit (Miltenyi Biotec), or CD19− cells were flow sorted on an Aria III cell sorter (BD Biosciences) through an 85-μm nozzle for purity. Purity was consistently >95%. For intracellular IFN-γ detection, NK cells were incubated for 18 h with 10 ng/ml rhIL-12, and a final concentration of 2 μM monensin was added (1000× solution; eBioscience) for the last 6 h. Cells were then harvested, washed with PBS and, after staining with the surface-binding Abs, fixed with 2% paraformaldehyde, and intracellular staining was performed in PBS plus 1% Saponin (Fluka) and BSA 1% (Sigma) using anti–IFN-γ Abs (clone 4S.B3; BD Biosciences). Wild-type EBV was produced through standard 4-h METAFECTENE PRO (Lucerna) transfection of the B95-8 bacmid carrying 293HEK cells in 10-cm dishes, according to the manufacturer’s protocol. In brief, plasmids (BZLF-1, Amp resistance; and BALF-4, gp110, Amp resistance) were preincubated with METAFECTENE at room temperature for 20 min and then added to the cell dishes for 4 h in antibiotic-free medium. Then, RPMI 1640 + 10% FCS medium was replaced with gentamicin-containing RPMI 1640 + 10% FCS medium medium. Supernatant was harvested after 3 d and filtered through 0.45-μm filters, and EBV was further purified and concentrated by ultracentrifugation at 30,000 × g for 2 h at 4°C, resuspended in RPMI 1640, and titered on Raji cells. GFP+ cells were counted 2 d later, and titers were calculated in Raji infectious units. This assay was adapted from the previously described protocol (15). Briefly, MACS-isolated B cells (as described above) were plated at 1 × 105 cells and cultured in RPMI 1640 + 5% human serum (Invitrogen) with 2 μg/ml gentamicin and infected with wild-type EBV; sorted NK cells were added at the indicated numbers. IL-12 was added at 10 ng/ml. 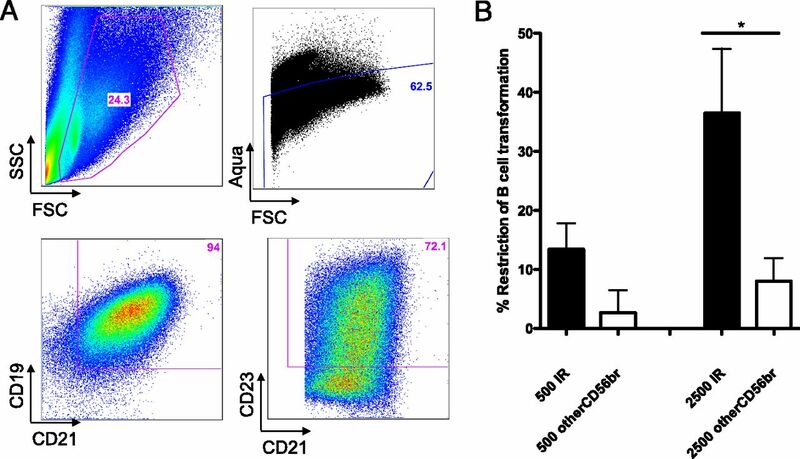 Cells were harvested after 12 d, and the numbers of transformed B cells were quantified by determining the ratio of live CD19+CD21+CD23+ transformed B cells/total live cells by flow cytometry. Percentage of restriction of B cell transformation = (1 − total transformed B cell number of sample with NK cells/total transformed B cell number of sample without NK cells) × 100. Flow cytometric data were acquired on an LSR II Fortessa cell analyzer (equipped with four lasers; Figs. 1, 2, 4) or an Aria III cell sorter (five laser lines; Fig. 3) (both using Diva software; all from BD Biosciences). General gating strategy for NK cells: lymphocyte population in forward/sideward scatter (FSC/SSC), live (Aqua−) cells, CD3−, CD56+. Data were analyzed using FlowJo 9.3.1.3. and GraphPad Prism for Mac version 5.0a. Data were compared using the two-tailed Wilcoxon signed-rank test, unless noted otherwise, or the two-tailed Mann–Whitney U test, if specified in the figure legends. A p value ≤ 0.05 was considered statistically significant. Error bars represent the SEM in all figures. Tonsils harbor a distinct subset of very high IFN-γ–producing CD56bright NK cells, which secrete this cytokine especially after IL-12 stimulation (4). This subset is not seen in peripheral blood, might play important bridging functions with the adaptive immune system, and could be an adaptation to target pathogens in SLOs at mucosal entry sites. To characterize this subset in more detail, we first determined its surface marker phenotype. To accomplish this, we purified NK cells by negative magnetic cell separation (MACS; Miltenyi Biotec) and stimulated them with 10 ng/ml IL-12 for 18 h. IFN-γhigh NK cells differ from the total CD56bright NK cells by their expression of NKG2A/CD94 and CD54, as well as the lack of l-selectin (CD62L) (Fig. 1A–C, Supplemental Fig. 1 [representative flow cytometry dot blots of subpopulations]). IL-12 was chosen for the stimulation of tonsilar NK cells, because it was previously identified as the primary monokine involved in NK cell activation by dendritic cells (15). To exclude the possibility that CD62L undergoes shedding and is lost from the surface of the NK cells due to sample preparation we determined its expression on naive T cells versus T EMRA cells (effector memory RA+) and found normal levels of l-selectin expression (Supplemental Fig. 3B). Tonsilar IR cells expressed slightly less NKG2C than did other CD56bright NK cells, but the overall expression was very low (data not shown). We confirmed the phenotype of tonsilar NK cells with high IFN-γ production by gating on CD56brightNKG2A+CD94+CD54+CD62L− cells after 18 h of IL-12 stimulation (10 ng/ml, as above) and found that this population consisted of nearly all IFN-γ–producing cells (Fig. 1D). To exclude overlap with the recently described tonsilar subset of CD336+CD103+ cells (27), we analyzed coexpression with these markers, as well as IFN-γ production, and found that both subsets were distinct (Supplemental Fig. 2). Taken together, these data show that IFN-γhigh NK cells in tonsils can be defined as CD56brightNKG2A+CD94+CD54+CD62L−. The human tonsilar IFN-γhigh NK cell IR subset is characterized as CD56brightNKG2A+CD94+CD54+CD62L−. Purified NK cells were stimulated with 10 ng/ml IL-12; monensin was added after 12 h, and cells were analyzed after 18 h by flow cytometry. (A) Gating strategy for analysis of distinct IFN-γhigh NK cell subset after IL-12 stimulation. The IFN-γhigh subset in tonsils is CD56brightNKG2A+CD94+ (B) and CD54+CD62L− (C). (D) Gated on this subset, these NK cells are almost exclusively IFN-γ+ after IL-12 stimulation (10 ng/ml, as above). Gating strategy: lymphocyte population in FSC/SSC, Live cells (Live/Dead cell stain Aqua−), NK cells (CD3−CD56+), subset gating as in (A). At least three independent experiments were performed, and data were summarized from >10 healthy donors. All error bars represent SEM. *p ≤ 0.05, **p ≤ 0.005, ***p ≤ 0.0005 two-tailed nonparametric Mann–Whitney U test. Next, we addressed whether this distinct NK cell subset (CD56brightNKG2A+CD94+CD54+CD62L−) is already present in tonsils without stimulation. To determine this, we analyzed tonsilar cells from children ex vivo and found a significant population of this subset (Fig. 2A). This subpopulation accumulated after stimulation of purified NK cells with IL-12 for 18 h (Fig. 2A). Expression of c-kit (CD117) is lost throughout the maturation process of NK cells (7); hence, its expression characterizes less mature cells. We found that fewer immunoresponsive (IR) NK cells express c-kit in tonsils compared with the other CD56bright NK cells in this organ. Conversely, more NK cells with this phenotype displayed this marker of immaturity in the peripheral blood compared with the remaining blood CD56bright NK cells (Fig. 2B, Supplemental Fig. 3A [gating strategy]). As a second parameter of maturation for NK cells, we determined the expression of KIRs, which are acquired throughout the maturation process (7). We found that IR NK cells express significantly more KIRs than do tonsilar CD56bright NK cells in general (Fig. 2C). In addition, we found that maturation-associated CD16 expression was significantly higher on tonsilar IR cells than on the rest of CD56bright cells in tonsils, whereas this expression pattern is reversed in blood (i.e., blood IR cells carry less CD16 than do the other peripheral CD56bright cells [Fig. 2G, 2H]). Overall, CD57 and perforin expression was very low, and there was no significant difference between the analyzed subsets (Supplemental Fig. 3C, 3D). As shown in Fig. 2E and 2F, we did not detect any difference in CXCR3 expression between IR and the rest of the CD56bright subset, nor in NKG2A median fluorescence intensity (MFI) on cells pregated on NKG2A+ cells, which might have further supported the advanced maturation status of these cells. In conclusion, we demonstrated that the distinct IR NK cell subset is already present in tonsils and blood ex vivo, accumulates upon IL-12 stimulation, and is more mature than the total tonsilar CD56bright NK cells but less mature than blood NK cells. The NK cell IR subset is present in tonsils ex vivo and accumulates upon stimulation with IL-12. (A) Percentages of total NK cells in the tonsil and CD56bright cells. Subset accumulates after 18-h stimulation with IL-12 (10 ng/ml). Significantly fewer tonsilar IR cells express c-kit (CD117) (B), whereas significantly more blood IR cells express this molecule (C), which is expressed by more immature NK cells. (D) More of the tonsilar IR subset expresses KIR molecules compared with total or CD56bright NK cells. IR cells express similar levels of CXCR3 (E) and the NKG2A MFI (subset versus CD56bright total) was not different between IR cells and the other CD56bright cells (F), pregated on NKG2A+ cells. (G) Greater frequency of CD16+ IR cells than CD16 expression in other CD56bright cells in tonsilar mononuclear cells (TMCs) and a higher level of expression (as measured by MFI ratio [subset/NK]). (H) In contrast, in PBMCs, a higher frequency of the other CD56bright cells expressed CD16 than did IR cells and to a greater extent, as measured by MFI ratio (subset/NK). Gating strategy: lymphocyte population in FSC/SSC, Live cells (Live/Dead Cell Stain Aqua−), NK cells (CD3−CD56+), subset gating: CD56brightNKG2A+CD94+CD54+CD62L−, as depicted in Supplemental Fig. 3A. Data represent at least three independent experiments and at least three donors. All error bars represent SEM. *p ≤ 0.05. Plasticity of immunological receptors determines whether molecules are reliable and characteristic marker molecules, defining the same cell subset under different activation conditions. High plasticity will hinder traceability of subsets through different conditions. Therefore, we assessed whether expression of the defined potential marker molecules was stable, even during prolonged cytokine stimulation, to determine whether this subset is stable throughout immunological processes and activation. The subset was sorted into the IR subset, the rest of CD56bright and the CD56dim NK cells (subset gating strategy in Fig. 3A) and stimulated for 7 d with IL-12 (10 ng/ml), IL-2 (100 U/ml), or IL-15 (100 pg/ml). Cells were collected, and expressions of marker molecules were analyzed. CD56 expression was highly variable after cytokine stimulation with IL-12 in our experimental setting (Supplemental Fig. 4A) and with IL-2 and IL-15 (Supplemental Fig. 4B, 4C). The IR subset became largely CD56dim after prolonged cytokine stimulation, which suggested a maturation status similar to blood CD56bright NK cells that were reported to turn into CD56dim upon stimulation (11). The other CD56bright cells conserved their high CD56 expression. CD56dim NK cells, which are the less mature NK cell population in tonsils, turned into CD56bright cells upon prolonged IL-2 stimulation. Thus, CD56 expression was disregarded for reanalysis of the potential marker molecules NKG2A and absence of CD62L. Expression of NKG2A was highly stable (Fig. 3B), and l-selectin negativity was preserved (Fig. 3C), even after prolonged cytokine stimulation with different cytokines in the IR subset. To identify the origin of the IR cells that accumulated after cytokine stimulation, expression of NKG2A (Supplemental Fig. 4C) and the absence of l-selectin (Supplemental Fig. 4D) and of the combined phenotype (Supplemental Fig. 4E) were analyzed on the rest of the initially CD56bright and CD56dim subset after prolonged cytokine stimulation. There was significant acquisition of NKG2A, loss of CD62L, and acquisition of the combined phenotype in CD56dim and the other CD56bright NK cells as the result of IL-2 and IL-12 stimulation. After prolonged cytokine stimulation of purified tonsilar NK cells, the IR subset retained the ability for elevated IFN-γ production (Fig. 3D). In conclusion, the defined potential marker molecules could be confirmed for the IR subset because they are preserved and stable throughout immunological activation modeled by prolonged cytokine stimulation; therefore, they define the subset reliably and characteristically under different activation conditions and can be acquired by non-IR tonsilar NK cells. The NK cell IR subset shows low plasticity, even after prolonged cytokine stimulation. NK cells were sorted into IR cells, other CD56bright NK cells, and CD56dim NK cells and stimulated with IL-15 (100 pg/ml), IL-12 (10 ng/ml), or IL-2 (100 U/ml) for 6 d, and NKG2A positivity and CD62L negativity were analyzed. CD56 expression changed after prolonged stimulation, as shown in Supplemental Fig. 4. (A) Sorting strategy; circled subsets are compared. Regardless of CD56 expression, IR subset shows very low plasticity in expression of NKG2A positivity (B) and CD62L negativity (C), even after prolonged stimulation with cytokines. (D) IR cells retain their superior ability to produce IFN-γ compared with the other CD56bright cells, as shown by the MFI ratio (subset/NK) after prolonged stimulation with IL-12 or IL-2. General gating strategy: lymphocyte population in FSC/SSC, live cells (Live/Dead Cell Stain Aqua−), NK cells (CD3−CD56+), IR: CD56brightNKG2A+CD94+CD54+CD62L−, as depicted in Supplemental Fig. 3A. Furthermore, subset gating for sorting was performed as in Fig. 1A, and for the analysis after cytokine stimulation, both NKG2A and CD62L were assessed. Data represent at least three independent experiments, with a total of three to six donors. All error bars represent SEM. *p ≤ 0.05. To investigate whether the defined IR NK cell subsets could provide a barrier function against pathogens that infect via the tonsils, we investigated their enrichment in EBV-seropositive individuals. Tonsils of children carrying EBV harbored significantly more of the IR subset of NK cells than did those of age-matched children not infected with EBV (Fig. 4A). The IR subset exists in peripheral blood ex vivo, even though this subset is markedly enriched in tonsils, and there are significantly fewer cells of this subset in the peripheral blood of EBV-infected children than in age-matched noninfected children. Adults have even fewer of the IR subset than do children (Fig. 4B). The IR cells in the peripheral blood have a higher capacity for IFN-γ production after IL-12 stimulation than do the other CD56bright NK cells (Supplemental Fig. 4G). The elevated frequency of IFN-γ–producing IR NK cells, as gated in Fig. 1A, in EBV+ tonsils was increased further after IL-12 stimulation (i.e., 1.6-fold in EBV− donors and 1.25-fold in EBV+ donors) (Fig. 4C). To characterize whether this accumulation of IR NK cells could provide protection in tonsils of EBV-seropositive individuals, we tested this NK cell subset’s ability to restrict EBV infection. EBV restriction by NK cells was measured by the B cell–regression assay, as described previously (15). Briefly, 100,000 MACS-sorted EBV-exposed autologous B cells were cocultured with different numbers of flow-sorted NK cell subpopulations and IL-12 (10 ng/ml) for 10 d. EBV-transformed B cells were identified by the gating strategy shown in Fig. 5A. IR NK cells were 4.5-fold more efficient in preventing the outgrowth of EBV-infected B cells in vitro than were other tonsilar CD56bright NK cells (Fig. 5B). These data provide direct evidence that the distinct IR NK cell subset has the ability to markedly restrict EBV-induced B cell transformation and is the optimum NK cell population in tonsils to perform this function. IR NK cells accumulate in EBV-infected tonsils. (A) Tonsils of children carrying EBV, a chronic and cancerogenic virus infection entering the human body via the tonsils, harbor significantly more of this subset of NK cells than do noninfected children. (B) IR subset exists in peripheral blood ex vivo, even though this subset is enriched in tonsils and there is significantly less of this subset in the blood of EBV-carrying children than in noninfected children. Adults have even less of the IR subset than do children. (C) Increased numbers of IR cells in EBV+ tonsils after IL-12 stimulation (i.e., mean frequency 1.6-fold in EBV− donors and 1.25-fold in EBV+ donors). Gating strategy: lymphocyte population in FSC/SSC, Live cells (Live/Dead Cell Stain Aqua−), NK cells (CD3−CD56+), subset gating CD56brightNKG2A+CD94+CD54+CD62L−, as depicted in Supplemental Fig. 3A. Data represent at least three independent experiments, with a total of 4–12 donors. All error bars represent SEM. *p ≤ 0.05, **p ≤ 0.005, ***p ≤ 0.0005 two-tailed nonparametric Mann–Whitney U test. 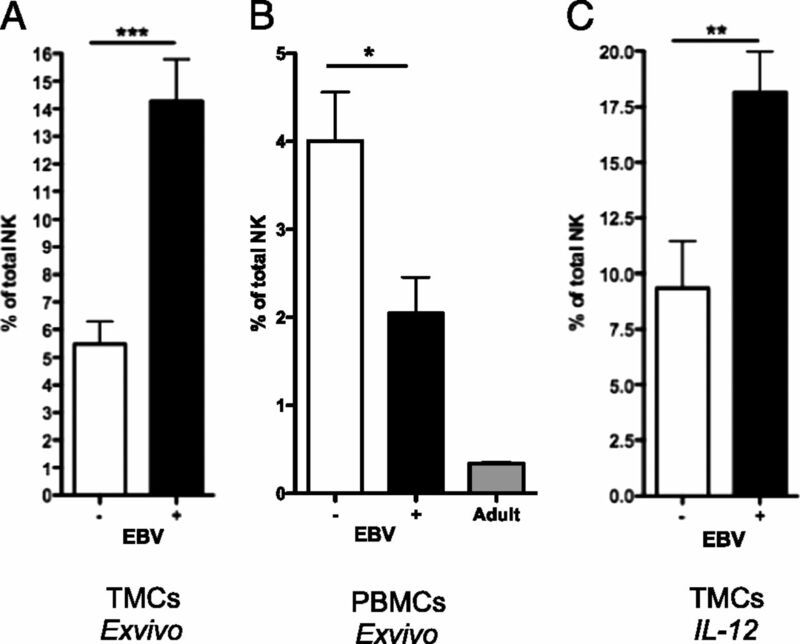 IR tonsilar NK cells potently restrict EBV-induced B cell transformation. Gating strategy for B cell analysis is shown in (A). (B) A total of 100,000 autologous B cells was infected with EBV and cocultured with the indicated numbers of sorted NK cells and IL-12 (10 ng/ml) for 10 d. The distinct IR subset has the ability to significantly restrict EBV-induced B cell transformation in physiological numbers (500 NK versus 100,000 B cells [i.e., 0.5% or a 5-fold increase]; 2,500 NK versus 100,000 B cells [i.e., 2.5%]). Gating strategy for sorted IR subset: lymphocyte population in FSC/SSC, live cells (Live/Dead cell stain Aqua−), NK cells (CD3−CD56+); subset gating: CD56brightNKG2A+CD94+CD54+CD62L−, as depicted in Supplemental Fig. 3A. Data from three independent experiments, with a total of four or five donors, are summarized. All error bars represent SEM. *p ≤ 0.05 two-tailed nonparametric Mann–Whitney U test. NK cells provide the first line of defense and play a crucial role against invading pathogens and emerging cancer cells (28–32). Our data demonstrate that these functions are mediated in part by these innate lymphocytes in SLOs and that the respective tonsilar IFN-γhigh NK cell subset is CD56brightNKG2A+CD94+CD54+CD62L−, is present in tonsils ex vivo and is more mature than other CD56bright NK cells in tonsils and less mature than other NK cells in peripheral blood, shows very low plasticity even after prolonged cytokine stimulation, accumulates in tonsils of EBV carriers, and is able to potently restrict EBV-induced transformation of B cells. Our findings suggest that a distinct NK cell subset is particularly operative against EBV at its portal of entry and could be exploited for the treatment of certain EBV-associated malignancies. Our study indicates that EBV induces the accumulation of CD56brightNKG2A+CD94+CD54+CD62L− NK cells with the capacity to produce high amounts of IFN-γ in human tonsils. These NK cells limit primary EBV infection of B cells more efficiently than do other tonsilar NK cell subsets and, therefore, could provide a crucial first innate barrier to infection in this portal organ of EBV entry. The reduced levels of IR cells in the blood of EBV+ donors might be the result of recruiting or retaining this subset in tonsils, a further differentiation of this subset in the blood, or a combination of these factors. Enrichments of distinct NK cell populations were described for other viral infections in humans, but superior restriction of the respective pathogens by these subsets is rare. Moreover, a tissue-specific accumulation, as we describe for human tonsils, has not been reported previously. Several studies showed persistent alterations in the NK cell repertoire after viral infections (13, 33, 34) and even protective effects of murine NK cell subsets (35, 36). Accumulation of terminally differentiated NK cell subpopulations were reported in hantavirus, chikungunya virus, human CMV, and HIV infections (13, 33, 37–39). These studies suggested that the respective viruses drive the accumulation of CD56dimCD16+KIR+CD57+ and often NKG2C+ NK cells, which could mediate recognition of infected target cells or, alternatively, just differentiate in response to the inflammatory cytokines that are secreted during viral infections. Respectively, these expansions were proposed to reflect NK cells with memory-like features that prepare the NK cell compartment for more rapid secondary responses to recurrent or persistent viral infections (35, 39, 40) or accumulating effector cells that are activated by memory CD4+ T cells via IL-2 secretion (41, 42). Very recently, cytokine-induced human memory-like NK cells were described (43). Both explanations for NK cell subset accumulation suggest that these innate lymphocyte populations should be explored for immunotherapy against the respective viral infections (e.g., by choosing adjuvants that would elicit cytokine production to promote in vivo differentiation of these NK cell populations or by adoptively transferring the respective NK cell subsets during symptomatic infection with the respective viruses and during dysregulation of persistent infections resulting in detrimental malignancies). Such NK cell–based therapies have been explored successfully in transplantation settings against hematological malignancies. Several clinical centers have observed beneficial effects of haploidentical bone marrow transplantation for residual leukemia clearance after chemotherapy, harnessing NK cell–mediated graft-versus-leukemia effects (44–47). This therapy seems to be most effective when bone marrow donor and recipient are mismatched in HLA class I molecules, and the donor carries significant NK cell populations that can detect this mismatch via their KIR repertoire (46, 48) and then target leukemic cells by missing-self recognition (49). In these instances, transient reconstitution of NK cells with a donor phenotype before NK cell tolerance against the recipient is implemented mediates the graft-versus-leukemia effect. Alternatively, alloreactive NK cell populations that are expanded in vitro can also be infused (50–52). Thus, these studies provide good evidence that NK cell therapies that transiently generate an alloreactive compartment of these innate lymphocytes are well tolerated and could be readily expanded to harness specialized antiviral NK cell populations. The recent description of cytokine-induced human memory-like NK cells suggests that cytokine stimulation for expansion of NK cells before transfusion could be beneficial in these therapies (43). For the subset of potent IFN-γ–producing NK cells that can restrict EBV-induced B cell transformation, described in this article, we demonstrated an accumulation after IL-12 stimulation. Non-IR NK cells can change their phenotype accordingly after prolonged cytokine stimulation. This could be readily harnessed to enhance future NK cell–based therapeutic options by cytokine prestimulation. We thank Claudia Dumrese for the excellent management of the flow cytometry facility of the University of Zurich; Florian Mair, Cornelius Fischer, and Vinko Tosevski for teaching A.L. how to sort cells by flow cytometry; and Claudine Gysin and her team for patient care, recruiting patients, and collecting tonsil and blood samples, thereby making this research possible. This work was supported by grants from the National Cancer Institute (R01CA108609), the Sassella Foundation (10/02, 11/02, and 12/02), Cancer Research Switzerland (KFS-02652-08-2010), the Association for International Cancer Research (11-0516), a Clinical Research Focus in Multiple Sclerosis (KFSPMS) and Clinical Research Focus in Hemato-Lymphatic Diseases (KFSPHLD) of the University of Zurich, the Vontobel Foundation, the Baugarten Foundation, the EMDO Foundation, the Sobek Foundation, Fondation Acteria, Novartis, and the Swiss National Science Foundation (310030_143979 and CRSII3_136241 to C.M. and SNF 310030_135028 to D.N.). A.L. was supported by the Marie Heim Voegtlin Scholarship from the Swiss National Science Foundation.
. 1975. Natural cytotoxic reactivity of mouse lymphoid cells against syngeneic acid allogeneic tumors. I. Distribution of reactivity and specificity. Int. J. Cancer 16: 216–229.
. 2004. The abundant NK cells in human secondary lymphoid tissues require activation to express killer cell Ig-like receptors and become cytolytic. J. Immunol. 172: 1455–1462.
. 2006. Evidence for discrete stages of human natural killer cell differentiation in vivo. J. Exp. Med. 203: 1033–1043.
. 2012. Innate lymphoid cells: emerging insights in development, lineage relationships, and function. Annu. Rev. Immunol. 30: 647–675.
. 2007. CD56brightCD16− killer Ig-like receptor- NK cells display longer telomeres and acquire features of CD56dim NK cells upon activation. J. Immunol. 178: 4947–4955.
. 2004. Epstein-Barr virus: 40 years on. Nat. Rev. Cancer 4: 757–768.
. 2006. Spectrum of Epstein-Barr virus-associated diseases. Annu. Rev. Pathol. 1: 375–404.
. 2003. Characteristics of Hodgkin’s lymphoma after infectious mononucleosis. N. Engl. J. Med. 349: 1324–1332.
. 2001. X-linked lymphoproliferative disease: a progressive immunodeficiency. Annu. Rev. Immunol. 19: 657–682.
. 2006. Infectious mononucleosis and risk for multiple sclerosis: a meta-analysis. Ann. Neurol. 59: 499–503.
. 2006. A novel primary immunodeficiency with specific natural-killer cell deficiency maps to the centromeric region of chromosome 8. Am. J. Hum. Genet. 78: 721–727.
. 2012. Bilateral adrenal EBV-associated smooth muscle tumors in a child with a natural killer cell deficiency. Blood 119: 4009–4012.
. 2000. X-linked lymphoproliferative disease. 2B4 molecules displaying inhibitory rather than activating function are responsible for the inability of natural killer cells to kill Epstein-Barr virus-infected cells. J. Exp. Med. 192: 337–346.
. 2013. Intraepithelial type 1 innate lymphoid cells are a unique subset of IL-12- and IL-15-responsive IFN-γ-producing cells. Immunity 38: 769–781.
. 2008. Functions of natural killer cells. Nat. Immunol. 9: 503–510.
. 2009. Natural killer cell tolerance licensing and other mechanisms. Adv. Immunol. 101: 27–79. 2008. Natural killer cells: diversity in search of a niche. Nat. Immunol. 9: 473–475.
. 2011. CD94 is essential for NK cell-mediated resistance to a lethal viral disease. Immunity 34: 579–589.
. 2010. HIV infection is associated with a preferential decline in less-differentiated CD56dim CD16+ NK cells. J. Virol. 84: 1183–1188.
. 2010. Primed antigen-specific CD4+ T cells are required for NK cell activation in vivo upon Leishmania major infection. J. Immunol. 185: 2174–2181.
. 2002. Effectiveness of donor natural killer cell alloreactivity in mismatched hematopoietic transplants. Science 295: 2097–2100.
. 2004. Determinants of antileukemia effects of allogeneic NK cells. J. Immunol. 172: 644–650.
. 2005. Improved outcome in HLA-identical sibling hematopoietic stem-cell transplantation for acute myelogenous leukemia predicted by KIR and HLA genotypes. Blood 105: 4878–4884.
. 2007. Donor natural killer cell allorecognition of missing self in haploidentical hematopoietic transplantation for acute myeloid leukemia: challenging its predictive value. Blood 110: 433–440.
. 1985. Host resistance directed selectively against H-2-deficient lymphoma variants. Analysis of the mechanism. J. Exp. Med. 162: 1745–1759.
. 2005. Successful adoptive transfer and in vivo expansion of human haploidentical NK cells in patients with cancer. Blood 105: 3051–3057.
. 2010. NKAML: a pilot study to determine the safety and feasibility of haploidentical natural killer cell transplantation in childhood acute myeloid leukemia. J. Clin. Oncol. 28: 955–959.
. 2011. Successful transfer of alloreactive haploidentical KIR ligand-mismatched natural killer cells after infusion in elderly high risk acute myeloid leukemia patients. Blood 118: 3273–3279.